Die Frage, welches der beste Gin für einen Gin & Tonic ist, wurde von der International Wine & Spirit Competition (IWSC) jetzt ganz offiziell beantwortet: Der finnische Napue Gin trug 2015 den Sieg in der ganz neu geschaffenen Kategorie Gin&Tonic davon. Wir gratulieren dem Team der Kyrö Distillery Company! Die fachkundige Jury bekam alle zu testenden Gins in einem Blindtasting in der Kombination mit Fever Tree Tonic im Verhältnis 1:3 in einem Highball Glas serviert. Kein Eis, kein Garnish. Die Kombination mit Rosmarin und Cranberries auf dem Bild ist der Tipp der Kyrö-Jungs. 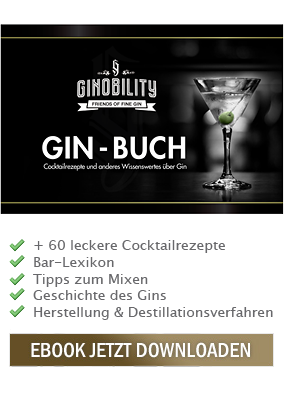 Wenn ihr euch davon überzeugen wollt, ob der Napue Gin auch euer Sieger wäre: Wir haben diesen Rye Gin seit kurzem bei Ginobility im Online-Shop (klick hier). Ach übrigens: Vor einigen Tagen haben ich Kalle Valkonen einige Interviewfragen geschickt, um euch den Napue Gin und seine Macher näher vorzustellen. Da ahnte ich noch nichts von der Prämierung durch den IWSC. Umso mehr freue ich mich natürlich, dass ich euch dieses Interview am Wochenende präsentieren werde. Schaut also unbedingt wieder hier vorbei!!! The gin & tonic is an iconic drink, often seen as quintessentially British and associated with upscale, metropolitan bars. But what if the world’s best gin & tonic comes from village of Napue, a place even Finns consider remote, a rural village of a few thousand inhabitants? This is what the judging panel at International Wine and Spirits Competition thought as they awarded Napue rye gin as the winner of the category. The International Wine & Spirit Competition, founded in 1969, is considered the world’s foremost competition in alcoholic beverages. Every year, the best brewers, wineries and distillers from over 80 countries compete for the honor of receiving an award from the IWSC, an honor considered one of the most prestigious in the business. This year, for the first time in IWSC history, a new category specifically for gin & tonics was created. A judging panel chaired by Ivan Dixon from Harvey Nichols did blind testings, based on a recipe of one part gin to three parts Fever-Tree tonic, in a highball glass. No ice or garnish was used. 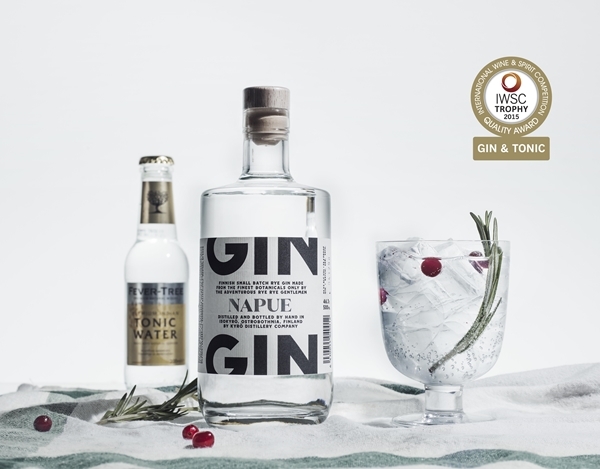 The panel stated that Napue gin (a rye based gin with some locally sourced Finnish botanicals) had won the coveted award for the best gin for G&T. The gin, Napue, was inspired by a childhood memories: “The grandparents of one of the founders had a sauna stuck between a meadow and an old, dark wood, one with primarily spruce trees. The birch, meadowsweet and spruce-y juniper remind us of the smells of the misty mornings at that place." says one of the developers Mikko Koskinen. The Kyrö Distillery Company is an artisanal Finnish distillery that works solely with rye, producing both single malt rye whiskey and rye gin in an old dairy in Isokyrö, Finland. Conceived in 2012, the distillery started production in 2014. Run by enthusiasts in a very small village, Kyrö shows how excellence in spirits can come from the most unlikely of places – even a village of only a few thousand inhabitants.